Definition: Rabies is a viral disease that causes inflammation of the brain in humans and other mammals. 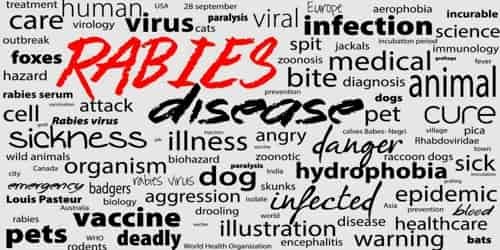 It is a zoonotic disease (a disease that is transmitted from animals to humans), caused by the rabies virus, of the Lyssavirus genus, within the family Rhabdoviridae. This virus is usually spread by the bite or scratch of an animal. Animals most likely to transmit rabies in the United States include bats, coyotes, foxes, raccoons, and skunks. In developing countries of Africa and Southeast Asia, stray dogs are the most likely to spread rabies to people. Domestic dogs are the most common reservoir of the virus, with more than 99% of human deaths caused by dog-mediated rabies. Early symptoms can include fever and tingling at the site of exposure. These symptoms are followed by one or more of the following symptoms: violent movements, uncontrolled excitement, fear of water, an inability to move parts of the body, confusion, and loss of consciousness. Once symptoms appear, the result is nearly always death. 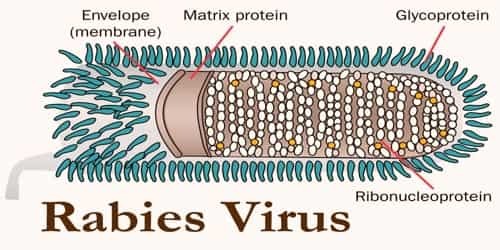 The virus is transmitted in the saliva of rabid animals and generally enters the body via infiltration of virus-laden saliva from a rabid animal into a wound (e.g. scratches), or by direct exposure of mucosal surfaces to saliva from an infected animal (e.g. bites). The virus cannot infiltrate intact skin. According to the World Health Organization, up to 59,000 people worldwide die from rabies every year. Ninety-nine percent of them have been bitten by a rabid dog. However, the availability of vaccines for both animals and humans has led to a steep decline in rabies cases. Rabies is a viral disease that is nearly always transmitted by an infected animal bite. Anyone who receives a bite in a geographical area where rabies occurs should seek treatment at once. For treatment to be successful, it must be given before symptoms appear. Symptoms include neurological problems and a fear of light and water. Following the vaccination requirements for pets helps prevent and control rabies. Rabies is present in more than 150 countries and on all continents but Antarctica. More than 3 billion people live in regions of the world where rabies occurs. A number of countries, including Australia and Japan, as well as much of Western Europe, do not have rabies among dogs. Many islands do not have rabies at all. It is classified as a neglected tropical disease. 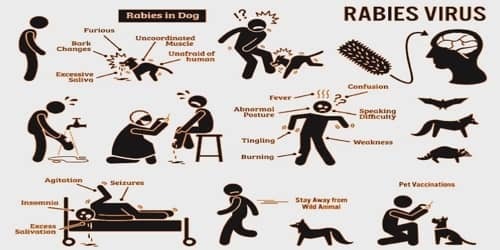 Causes, Signs, and Symptoms of Rabies: Rabies infection is caused by a number of lyssaviruses including the rabies virus. The virus is spread through the saliva of infected animals. Infected animals can spread the virus by biting another animal or a person. In rare cases, rabies can be spread when infected saliva gets into an open wound or the mucous membranes, such as the mouth or eyes. This could occur if an infected animal were to lick an open cut on people’s skin. There are two types of rabies. Furious, or encephalitic rabies: This occurs in 80 percent of human cases. The person is more likely to experience hyperactivity and hydrophobia. Paralytic or “dumb” rabies: Paralysis is a dominant symptom. The period between the bite and the onset of symptoms is called the incubation period. It usually takes four to 12 weeks for a person to develop rabies symptoms once they’re infected. However, incubation periods can also range from a few days to six years. Paralytic Rabies – This form of rabies takes longer to set in, but the effects are just as severe. Infected people slowly become paralyzed, will eventually slip into a coma, and die. According to the World Health Organization, 30 percent of rabies cases are paralytic. Prognosis: In unvaccinated humans, rabies is almost always fatal after neurological symptoms have developed. Vaccination after exposure, PEP, is highly successful in preventing the disease if administered promptly, in general within 6 days of infection. Begun with little or no delay, PEP is 100% effective against rabies. In the case of a significant delay in administering PEP, the treatment still has a chance of success.